The objective of this chapter is to provide a comprehensive framework to answer the question “What are the European higher education principles?”. The first section gives preliminary definitions of key notions for this framework: ‘principles’ and ‘normative space’. The second section presents European higher education principles as derived from European general principles, and articulated to the European market vision. The third section interprets them as embedded in the “University normative space” and connected to its principles and values. 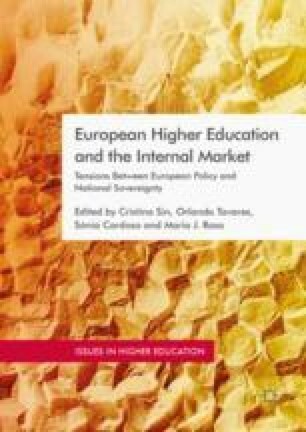 The fourth and conclusive section proposes to define European higher education as a normative space at the intersection between two normative spaces, “Europe” and “University”, and to differentiate between the EU (market) and EHEA (hybrid) versions of these European higher education principles.